Silver has been consolidating since August 15 and has been stuck in a sideways channel. The neutral to bearish picture in the medium term looks to last for a while longer after prices failed to break above the upper channel in the preceding month. 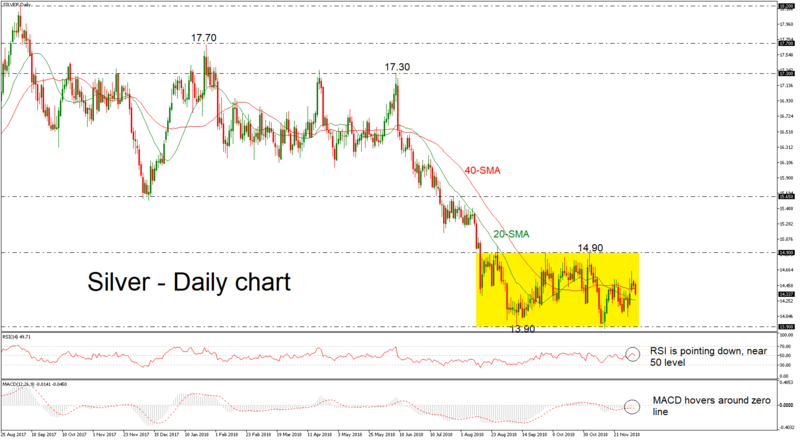 Resistance was met at around 14.90 region and significant support at 13.90, forcing the price to remain in a range. Technical indicators confirm this view with the RSI approaching the 50 level with weak momentum and the MACD oscillator stands around the zero line, above the red trigger line. If prices continue to head lower in the near term, support should come from the 20-day moving average (SMA) near the 14.26 mark. A drop below the 20-day SMA would send prices towards the lower band of the range at 13.90. If the market fails to halt inside the consolidation area, this would reinforce the long-term bearish structure and the price could hit the 13.58 support, reached on December 2015. However, should an upside reversal take form, immediate resistance will likely come from the 14.90 barrier. A break above this region could shift the bias to a more bullish one with the next resistance coming from the 15.65 level. Overall, silver has been developing in a downtrend since July 2016 in the long-term, while in the short-term view the price needs to exit from the range for a clearer direction.